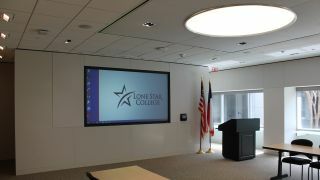 Lone Star College (LSC)-University Park Conference Center has installed TEKVOX Drop-In A/V solutions throughout the venue for the purpose of outfitting multiple rooms in modular configurations to meet its current and foreseeable audiovisual technology needs. With more than 22,000 square feet of meeting space that can be arranged in a variety of configurations, the LSC-University Park Conference Center has also simplified AV tech setup for LSC staff with factory-preprogrammed touchscreens—a push-button solution with TEKVOX Drop-In A/V systems. As one of the fastest-growing community colleges in the nation, LSC looks toward innovative technology companies to meet the needs of its 99,000 students across six campus locations. TEKVOX is represented in more than 1,000 LSC classrooms, lecture halls, and conference rooms. “The LSC-University Park Conference Center demonstrates our forward-thinking attitude toward technology,” said Butch Juelg, associate vice chancellor, office of technology services at LSC. TEKVOX Drop-In A/V solutions are automated, network managed, and factory programmed, and are configured for simplified integration and installation, reliability, and maintenance. Within the standard Drop-Ins, application-specific configuration options include combining or dividing rooms at a touch, optimizing conference table installation, adding podium/credenza inputs and control to conference rooms, and making conference rooms and board rooms ready for complex audio and VTC integration. At the University Park Conference Center, two TEKVOX Drop-In A/V solutions with distributed control serve as separate and independent head ends, one for the building’s conference center floor and one for the executive briefing center’s array of rooms. Each system features a 32-slot flexible matrix and is populated with 4K technology to meet users’ current and future needs. TEKVOX teamed with CX2 to design the custom Drop-In and audio solutions for the conference center, tailoring the head ends for the rooms’ different configurations: number and type of displays, inputs for roll-in podiums in the executive briefing center, and fixed inputs in the larger conference rooms. “The system is operated by simple in-room touchscreens,” Reinhart said. “No training and no special maintenance are required. Users can control anything from any touchscreen in the facility, and layout changes—when a room is partitioned, for example—are transparent to the user.